There are a lot of MMORPG's out there using alternate attributes of one sort of an other to allow the player to customize their character the way they want. EverQuest II is no exception to that and calls it Alternate Advancement. 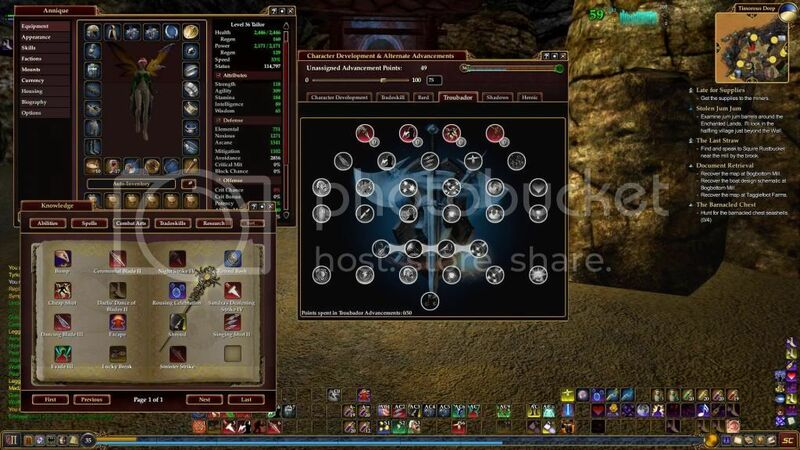 But what happens when the developer of such an MMORPG decides to make changes into these attributes? Yes, indeed, you need to re-specify those old attributes all over again! EverQuest II had such a change recently (not sure how recently, but since the last time I played in April this year), and both my characters had all their Alternate Advancement points reset. I was quite frustrated by this reset, and it took me about an hour to figure out how I wanted to to set my Alternate Advancement points this time. The changes made to the system were good, very good. It's now a system where you can spend 5 points in the 1st line and then spend everywhere in the 2nd line, where in the past you could only use attributes in the 2nd line directly below the skill.